As the UK Government conducts its first ever full-scale enquiry into the environmental and social impact of fast fashion, what can the fashion industry do to resolve the contradiction inherent in catering to its customers’ insatiable desire for new clothes while producing these in an eco-friendly and socially responsible manner? And, more importantly, how can brands and retailers make sustainability pay and ensure that doing the right thing benefits their bottom line as well as people and planet? 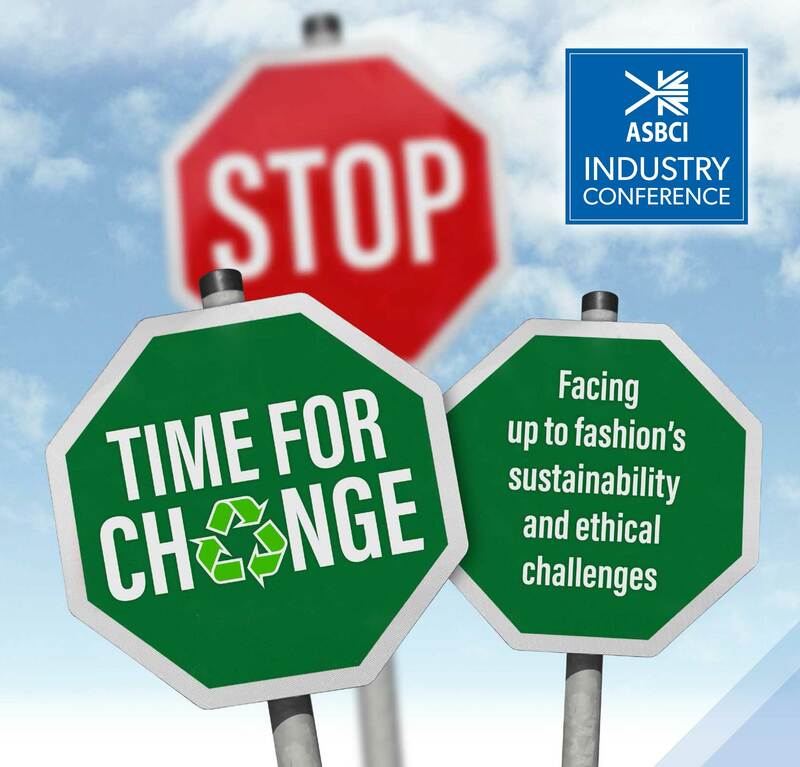 The ASBCI’s latest conference will examine sustainability and ethics in the fashion supply chain with the aim of finding practical solutions to difficult problems. From carbon footprints to modern slavery, and from wasteful retail practices to landfill, the conference will address the big issues and ask: is it up to the industry to change the way consumers shop, or up to consumers to change the industry? The ASBCI prides itself on the range of subjects and quality of speakers at its conferences and this will be no exception. Don't forget to keep an eye on our social media channels for updates. The fashion industry has been identified as the second biggest contributor to the problem of modern slavery, according to the Global Slavery Index 2018. Daphne Guelker from UL Consumer Retail Services (Gold Sponsor) will address this complex issue for brands and retailers, explaining the changing legal landscape around migrant labour and human trafficking and presenting case studies addressing modern slavery in the fashion supply chain. Michael Spenley & Colin McDowell OBE will cover "Fashion, Sustainability & Ethics - Past, Present & Future" - what we've learned and what we've seen; the challenges we've faced and face now; why we are still hopeful. Paul Smith from Missguided will talk about 'How to empower this generation of young women to look and feel confident, in a way that's sustainable for the next'. Lucy Murphy from Shirley Technologies will outline fashion’s very real environmental concerns and explain how environmentally responsible manufacturing is essential to securing the industry’s future. Drawing on its experience of auditing textile plants all over the world, the company will share its insights into the world of textile production behind the storefronts and how the fashion industry is taking steps to clean up the harmful environmental effects of manufacturing. Carly Bilsbrough, from Shop Direct Group will speak about enhancing recruitment practices in the textile industries in southern India. Phil Townsend from Marks & Spencer will share the retailer’s experiences on its journey to source only sustainable cotton. Peter Hughes, sustainability lead at Eurofins / BLC Leather Technology, will touch on the emerging trend for vegan alternatives to leather. He will discuss the complexity of developing vegan products, including raw material choice, chemical processing, finishes, and end of life issues, and the importance of verifying all components. Mark Sumner, lecturer in sustainability, fashion, and retail from the University of Leeds, will focus on consumer psychology and behaviour and whether there are any rewards for brands and retailers working to make their businesses greener. Jackie Lewis, Senior Consultant from Alvanon will present a case study demonstrating the financial rewards reaped by sustainable Dutch fashion brand Studio Jux as a result of its emphasis on environmental and social issues. Garry Knox, sustainability director for GreenEarth Cleaning (Silver Sponsor), will look at what happens to garments after purchase and how to make them last longer with sustainable aftercare. Andrew Morgan, head of corporate responsibility at Coats (Sliver Sponsor), will cover the topic "Pioneering a sustainable future". Vanessa Wakefield from Recyclatex Group will address issues around clothing reuse and efforts to reduce the amount of clothing and textiles that ends up in landfill in the UK – currently 350,000 tonnes annually – which is estimated to cost the UK economy more than £80 million a year.